The popularity of hemp started declining way back in the 1930s when hemp was grouped with marijuana in the Marijuana Tax Act of 1937. Under this act, all hemp sales were heavily taxed, which led to an accelerated decline of the entire hemp industry. Many hemp businesses went out of business during this period. Under the Controlled Substances Act of 1970, hemp was grouped with marijuana and was declared a Schedule 1 drug. Schedule 1 drugs are considered to have high abuse potential and severe safety concerns. If the Marijuana Tax Act started the decline of hemp, this act put the final nail in the coffin for the hemp industry. Although businesses were allowed to start importing hemp from other countries in 1998, we are still not fully allowed to grow hemp on US soil. Even with the wealth of information pouring out about the benefits of hemp, our government has been slow in making progress towards hemp legalization. In 2013, Colorado legalized industrial hemp farming that allowed commercial cultivation of hemp in the state regardless of federal law. Farmers just had to pay for a state permit, provide their field’s GPS coordinates, and verify the crop’s low THC levels. In order to develop seed varieties with different traits, the bill also allowed research crops of up to 10 acres for plants that for now might have higher THC. 2014 was a landmark year for the hemp at the national level as President Obama signed the Farm Bill on February of 2014.This bill included a section called Legitimacy of Industrial Hemp Research (Section 7606) that defines industrial hemp as distinct and authorizes institutions of higher education or state department’s of agriculture in states that legalized hemp cultivation to conduct research and pilot programs. Since then, many steps have taken proactive steps to start piloting and researching hemp production. 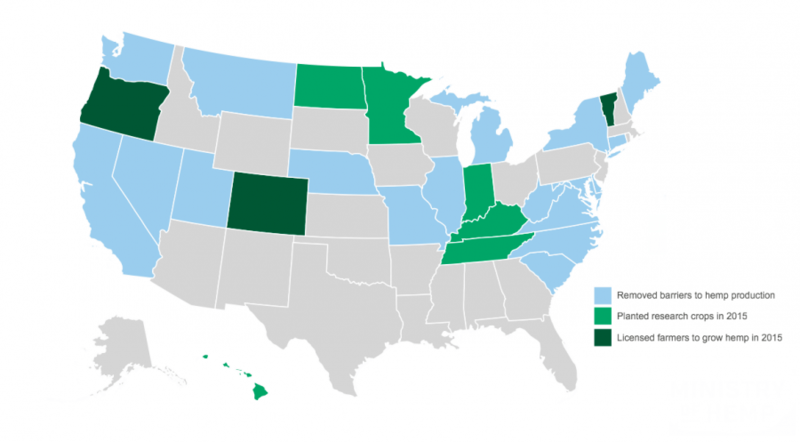 To date, 33 states have introduced pro-hemp legislation and 20 have passed some sort of hemp bill.This is a great way to bring hemp back as the US has lost all its hemp knowledge over the past 80 years. Canada followed similar steps prior to ramping up its hemp crop in 1998. They conducted government-sponsored research starting in 1994 for the best cultivars. This has allowed their hemp industry to grow at an annual rate of 20%. Even with all this progress, farmers in all these states still risk being raided by the DEA, going to prison, and losing their property because the federal policy fails to distinguish non-drug oilseed and fiber varieties of industrial hemp from the psychoactive drug varieties (i.e., “marijuana”)We need to adopt the Canadian model and have our law enforcement support our farmers. The DEA doesn’t need to lose their jobs by legalizing hemp. They can help enforce the industry’s regulations through crop inspections, testing, and farmer registration. States that have removed barriers to hemp’s production (27): California, Colorado, Connecticut, Delaware, Hawaii, Illinois, Indiana, Kentucky, Maine, Maryland, Michigan, Minnesota, Missouri, Montana, Nebraska, Nevada, New York, North Carolina, North Dakota, Oregon, South Carolina, Tennessee, Utah, Vermont, Washington, West Virginia and Virginia.